Spring is in the air at Walt Disney World Resort! To celebrate, Minnie Mouse and pals are dressed in their garden party best, ready to host a springtime soiree during Minnie’s Springtime Dine at Hollywood & Vine at Disney’s Hollywood Studios. On the menu, you will find classic picnic food with a twist, like refreshing coconut-lavender lemonade and springtime salads like watercress or basil-lime fruit salad. Hearty entrees include barbecue meatballs, buffalo baked chicken, lobster and shrimp mac ‘n cheese, herb-roasted pork and more. For dessert, your can indulge in passion fruit cheesecake, key lime tarts and banana cream puffs. Reservations are now open, and are available online at DisneyWorld.com/dine or by calling 407-WDW-DINE or contact me for more information. You can enjoy a FREE meal per person, per night at quick-service locations when you book a non-discounted 4-night/5-day Walt Disney World resort room and ticket package at a Disney Value Resort hotel for arrivals most nights May 29 – June 30, 2016 and July 5 – August 13, 2016. Redeeming the quick-service meal is convenient and flexible. Each member of your party is entitled to one meal per night of your stay. Choose from breakfast, lunch or dinner at a wide array of Quick-Service locations throughout Walt Disney World Resort. Click here for more details. Contact me for a free, no obligation quote for your Walt Disney World vacation. dining locations. Operating hours, menus, Characters, entertainment, participating locations, components and terms are subject to change without notice. not be responsible for the non-utilization of package components due to refurbishing, capacity, inclement weather or any circumstances beyond their control. Throughout the year, Minnie invites Guests to join her and her friends for fabulous dinner parties at Hollywood & Vine at Disney’s Hollywood Studios. These marvelous nights feature unique music, décor and menu items to celebrate each season. 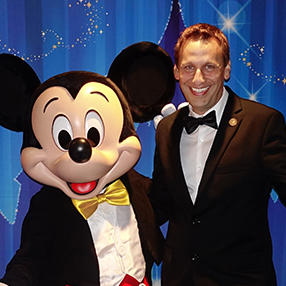 With award season just around the corner, Minnie and friends are celebrating the glitz and glamour of Tinseltown with Minnie’s Silver Screen Dine at Hollywood and Vine, January 4 – March 20, 2016 at the Walt Disney World Resort in Florida. You can join Mickey, Minnie, Donald, Daisy and Goofy for this perfect Hollywood party filled with dazzling décor and a musical score. And, no fabulous party is complete without stellar eats. Scene-stealing soups (including the famous creamy popcorn soup, garnished with caramelized popcorn), best supporting appetizers, outstanding leading entrees (bacon-wrapped pork loin, lobster and shrimp macaroni and cheese and honey-bourbon glazed turkey are headliners) and themed desserts are on the menu. Tonight, the Star Wars-themed “Symphony in the Stars: A Galactic Spectacular” fireworks show will blast off for the first time at Disney’s Hollywood Studios, and you can watch it live online! This new show is the latest in a number of Star Wars offerings debuting this month at Disney’s Hollywood Studios, including Star Wars Launch Bay and Jedi Training: Trials of the Temple. For a first-hand look at this dazzling Star Wars-themed fireworks display, head over to the Disney Parks blog tonight, December, 18 at 11 p.m. EST (8:00 p.m. PST) to watch a live stream of the first show. In addition, beginning January 5, 2016, you can experience the fireworks from a reserved viewing area during a special dessert party – “Symphony in the Stars: A Galactic Spectacular Dessert Party.” In addition to Star Wars-themed desserts and drinks, receive a souvenir stein featuring one of the most beloved Star Wars characters, Chewbacca. The dessert party costs $69 for adults and $39 for children. Tax and gratuity are included. Advance reservations are recommended, so contact me for details…and may the Force be with you! Stay, Play, Dine and save this winter at Walt Disney World Resort. Take advantage of the Play, Stay, Dine package which includes room, theme park tickets, and dining!! Yes, food and snacks are included! This is a great savings, so contact me for a free quote or to book your Walt Disney World vacation. You can save up to 25% on rooms at select Walt Disney World Deluxe and Deluxe Villa Resort hotels. These include Disney’s Grand Floridian Resort and Spa, Disney’s Animal Kingdom Lodge, Disney’s Polynesian Village Resort, and more! This offer also includes complimentary MagicBands – amazing all-in-one devices that allow you to unlock your room door, enter parks, check in at Disney FastPass+ entrances, charge purchases to your room and more. Plus, when you stay at a Disney Resort hotel, you’ll be able to make Disney FastPass+ selections up to 60 days prior to check-in for the entire length of your stay. When you stay at a Disney Resort hotel, you’ll also enjoy special benefits, including extra time in the parks before they open and after they close, complimentary resort transportation and parking, complimentary airport service, Resort hotel entertainment and legendary Disney customer service. View my detailed eBrochure for more information about Walt Disney World for 2016. Rooms are limited, so contact me for a free quote or to book now for best selection.